U.S. supplier Gentex Corp. provides the new Land Rover Discovery with auto-dimming mirrors that can be fitted with optional Automatic High-Beam Assist functionality. The system is designed to dim the headlights to prevent them from temporarily blinding other drivers. The device detects oncoming traffic using a camera integrated into the mirror. Software then processes the image data to decide whether the high beam should be deactivated. The light-dimming technology also is offered on the 2010 Range Rover Sport. Numerous suppliers contribute to the fourth-generation luxury SUV's powertrain. Germany's ZF Friedrichshafen AG provides the Discovery's automatic and manual transmissions. Meanwhile, Magna Powertrain, a unit of Canadian-Austrian parts group Magna International Inc., supplies the integrated transfer case. The electro-mechanically actuated transfer case improves torque transfer and traction in all conditions, thereby improving off-road capabilities. Dana Corp. provides its high-performance front and rear axles. According to the U.S. supplier, its design offers best-in-class noise vibration and harshness (NVH) refinements. The axles come from Dana's plant in Birmingham, England. TI Automotive Ltd. provides the vehicle's booster lines. TI Automotive won the contract from Toyoda Gosei Co. Ltd. after the Japanese supplier closed its U.K. plant in Market Harborough in 2008. Land Rover assembles the Discovery at its factory in Solihull, England. 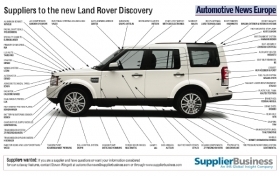 Land Rover unveiled the Discovery 4, alongside its new Range Rover, at the 2009 New York auto show. The Discovery will offer the following engine options: 2.7- or 3.0-liter V-6 turbodiesels; 4.0- or 5.0-liter V-6 gasoline engines; and a 5.0-liter V-8 gasoline powerplant.